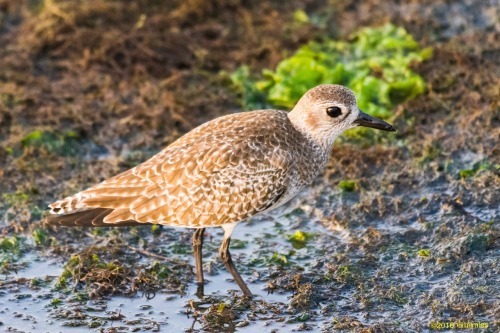 Libby found a Pacific Golden-Plover on Goleta Beach out near UCSB yesterday hanging around with all the Black-bellied Plovers. Jasen and Nick were still seeing it late in the day, so I set the alarm for 4:30 and was there before sunrise this morning. I met Brad looking for the same bird, but he didn’t see it either. So I headed home to go to work. The great thing about crack-of-dawn birding is you can see lots of great birds and still be at work by 9. Forty-five minutes later Marge and Don posted to eBird with photos of the bird, taken right where I’d been, just after I left. Argh! So later in the day I made another trip, and this time I found the bird; yay! When I got there I saw Brad in the distance, so I know he went back, too. He carries a camera with a ginormous lens when he’s chasing rarities, so I was hoping he saw the bird and got photos better than the blurry ones I digiscoped from a distance. And he did! Check it out.